GRAFENWOEHR, Germany — The National Day of Prayer is an annual observance which takes place on the first Thursday in May. The day’s purpose is to provide information on the National Day of Prayer observance and its significance to the United States Army. The National Day of Prayer was established for participation from all religions with a clear focus on praying for the Nation. The National Day of Prayer is not designed for political endorsement or statement, the endorsement of one religious service, program or event to the exclusion of others. The National Day of Prayer is different from the National Prayer Breakfast, which normally takes place on the first Thursday in February and is often hosted by the President of United States in Washington, D.C.
Army Chaplains have sponsored or participated in unit or installation-level observances for the National Day of Prayer. The National Day of Prayer Task Force, recommends that prayer efforts focus on those in positions of authority. Those positions of authority include judges, educators, police and fire chiefs, school board members, military leaders, and elected officials. Army chaplains advise commanders on appropriate ways to pray for military personnel to include: Soldiers and civilians, deployed personnel, wounded warriors, units and leaders, and their family members). Commanders may coordinate to have installation-level events or observances in lieu of unit-level events. What will the Army do in the future? The United States Army will continue to sponsor National Day of Prayer observances with a focus on prayer by individuals or groups involving a broad spectrum of religions and religious leaders. The first amendment of the United States Constitution provides for the free exercise of religion. The United States Army places a high value on the rights of its Soldiers to observe the tenants of their respective religion or to observe no religion at all. The National Day of Prayer is one opportunity to provide for the free exercise of religion for those individuals who choose to participate. 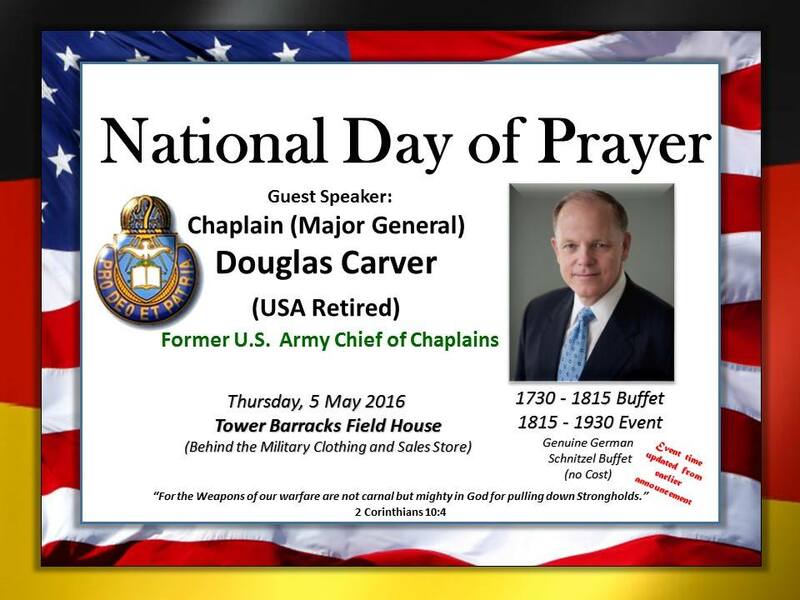 USAG Bavaria observes the National Day of Prayer at the Tower Barracks Field House May 5. The event kicks off with a free of charge German Schnitzel buffet at 5:30 p.m. Chaplain Maj. Gen. (ret.) Douglas Carver, the guest speaker of the event and former U.S. Army Chief of Chaplain, will start his presentation at 6:15 p.m.
Chaplain (Major General) Douglas L. Carver, United States Army, Retired, is the Executive Director of Chaplaincy Services for the North American Mission Board, providing professional and pastoral support to 3,600 Southern Baptist Chaplains who minister in various institutional settings around the world. He retired from the U.S. Army in 2011 after serving 38 years of military service on behalf of our country. His last duty position was as the 22nd Army Chief of Chaplains at the Pentagon in Washington, DC, serving over 2,900 chaplains who support the religious and pastoral needs of our 1.2 million soldiers and families. For more on the National Day of Prayer, go to www.army.mil/chaplaincorps and www.nationaldayofprayer.org.